got any sources on that?or is that just a guess?? ?i can see it coming out in 3-4 years becouse of the amount of time it takes to make a good crisp game. its not gonna take no 10 years though. 5 at the very most. no,they are going from ps2 to ps3.they cant exactly keep the same engine and models becouse of the higher capabilities of the ps3. I think Rix means they aren't going to do different costume design. 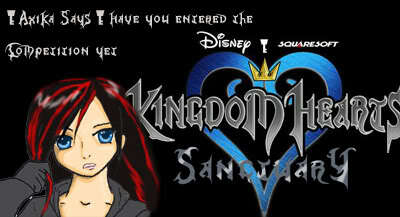 I hope Sora and company will be in the next Kingdom Hearts. The end of KH2 just left you hanging. What did the King's letter say. no,she said time and money.she means technology wise.costume designes take a pinch of time but no extra money than what it would take to use the same costume from khII in better graphics. well, if it goes to PS3, it better look as damn good as the Birth By Sleep vid. Yeah i forgot about the engine change. i did mean time and money, they didnt change goofy and donald for the second games just reused the models. but now that youve reminded me about changing form PS2 to PS3 they will have to make everything from scratch. but if they werent planning to use those three why would they do the ending in KH2 like they did? (tries not to give any spoilers) not the secret ending but the normal one. it could just be a letter from mickey saying thanks for everything.it doesnt have to be another problem for them. there is another journey in store for them. I think he'll be back... they can't just kick him out! one of my theories with Sora and the crew is that they're going in another game, but seeing as KHIII is going to have different character they'll prolly made another game for a different platform, like they did with CoM. You know they might... Sora and Riku are cool! How could they just get rid of them?? XIII wrote: no,they are going from ps2 to ps3.they cant exactly keep the same engine and models becouse of the higher capabilities of the ps3. Location : On mah couch. Drinking juice! In The World That Never Was.